We can officially cross another big event off of our Summer Bucket List! 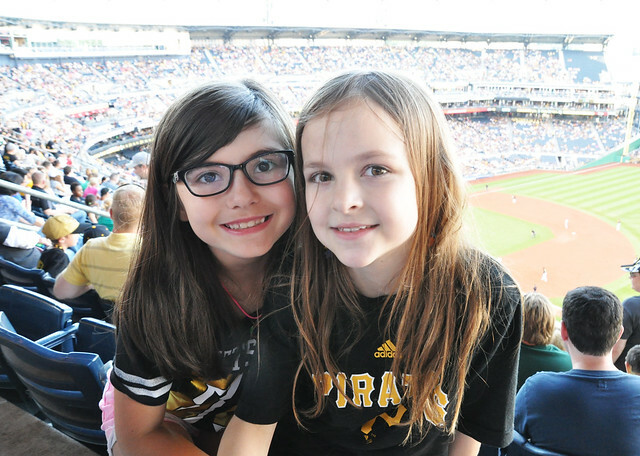 Our local library kicked off their summer reading program with a raffle, and one of my kids won 10 tickets to Tuesday night's Pittsburgh Pirates game! The kids were SO excited! We decided to invite my niece, Aubrey, and our friends Audrey, Jack, and Rex to join us! 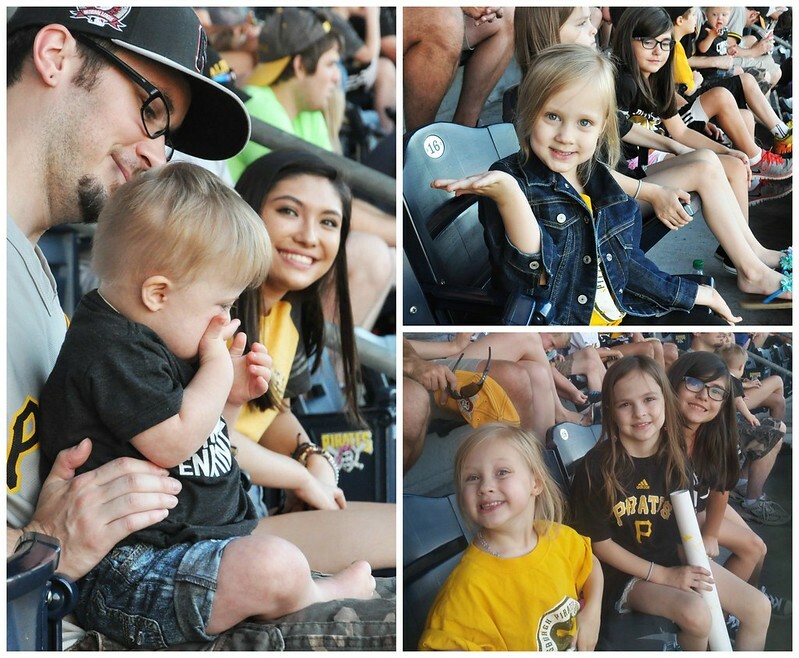 It was Aubrey's first Pirates game! 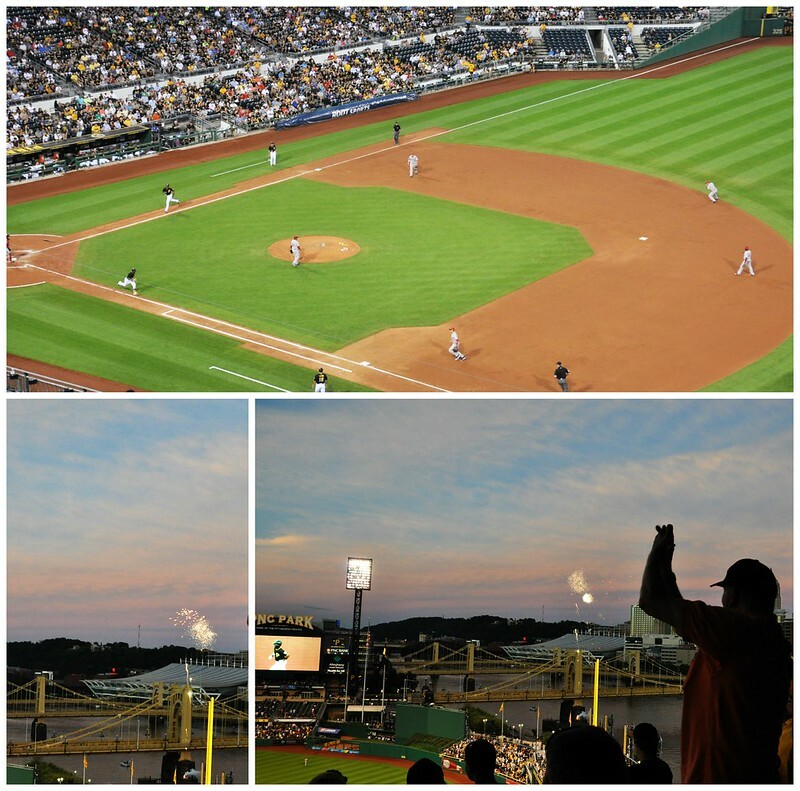 It was a great night for a game. The weather was gorgeous, and the view from the park is always spectacular! Each of the kids had a buddy. Aubrey and Lexie, Dylan and Jack, and Audrey and Lily. Liam bounced between Grant and I, but he loved the game. 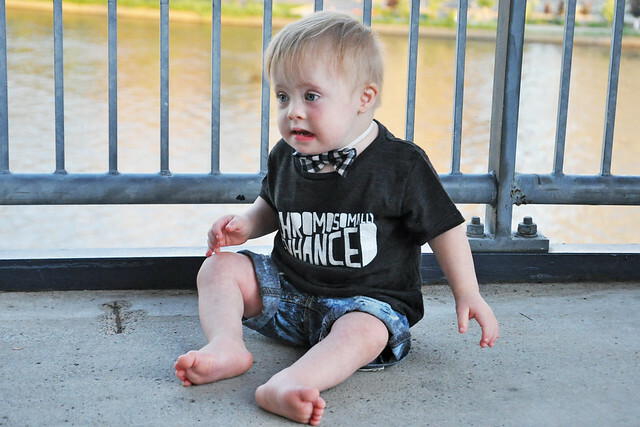 Every time he heard a cheer, he started clapping! Lily was finally old enough to enjoy it, too! 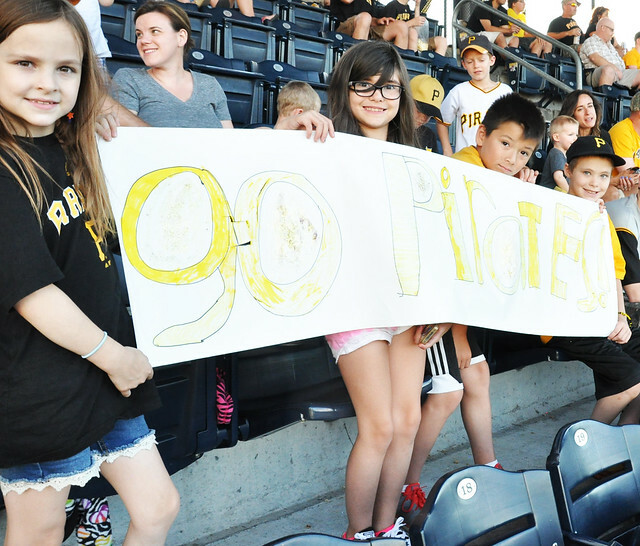 The kids worked so hard on their banner and they were certain they were going to get on TV. No such luck, but they tried! 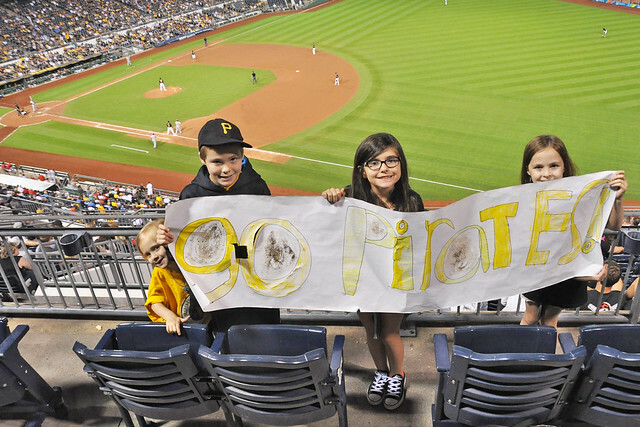 After a few innings the kids had to go to the bathroom-of course! 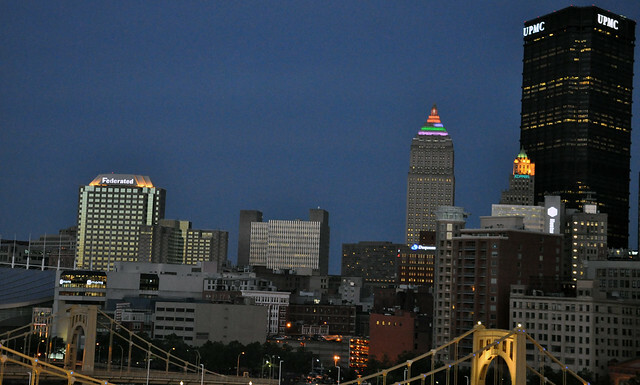 I took the girls and Liam down to the restroom, then let them enjoy the gorgeous view of the city from the balcony. 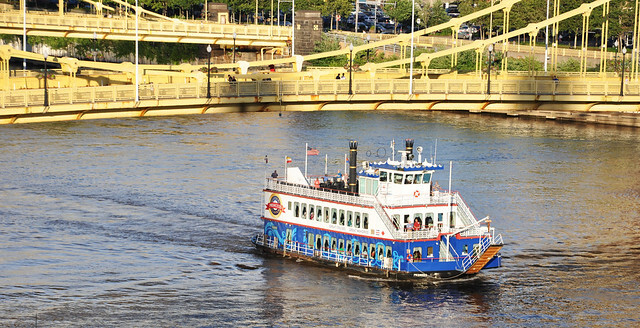 Liam paid no attention to the beautiful river and cityscape. He was all, "Hey, my hands are so awesome!" 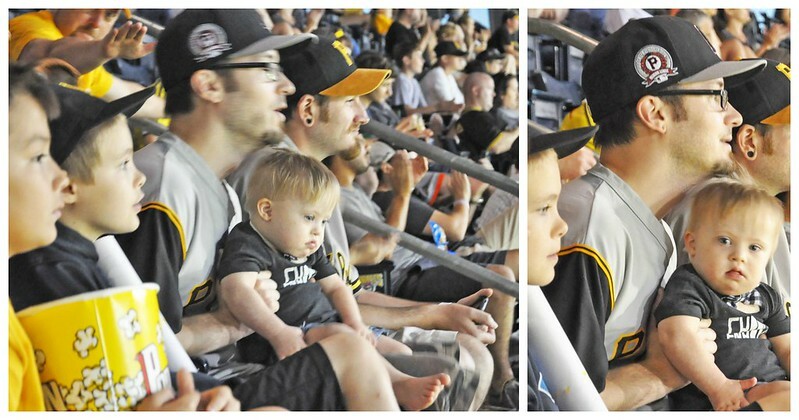 We headed back to our seats, but as soon as we reached the top of the steps, Liam pooped-of course! All the changing tables were occupied, so he got a riverside diaper change. He was unimpressed. In true boy fashion, the game was all he cared about! 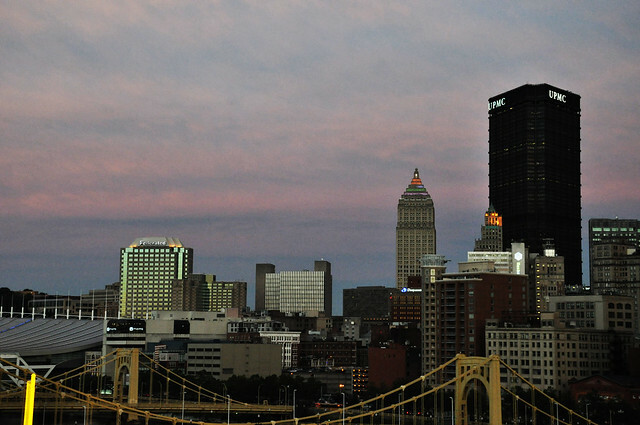 Shortly after we returned, the sun began to set over the city. THAT'S when the game got exciting! 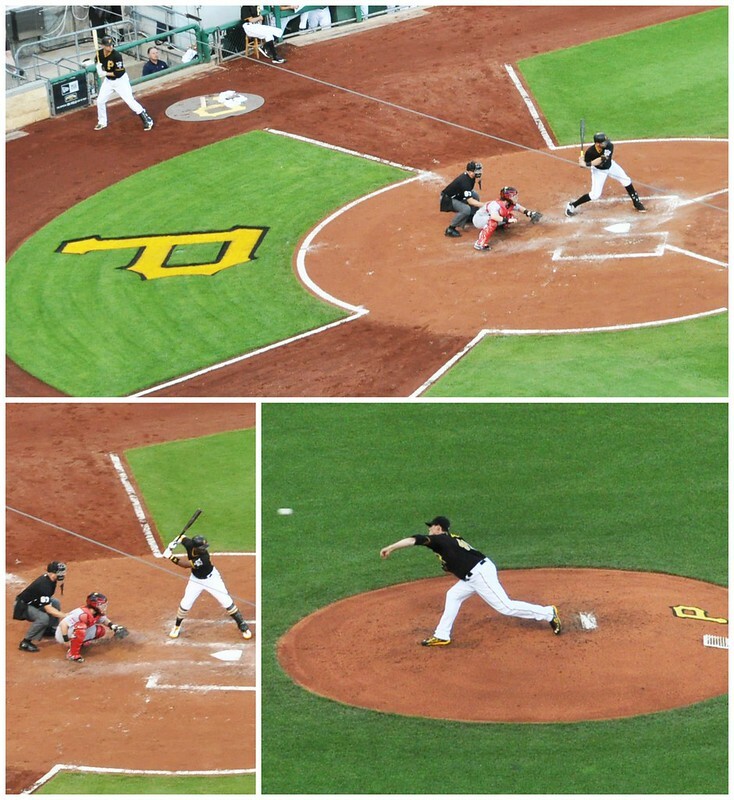 A huge hit resulted in a homerun. 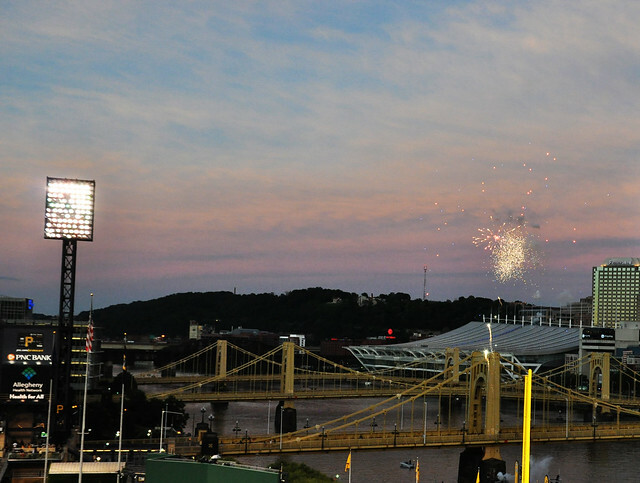 They set off fireworks every time the Pirates get a homerun, so it made the game extra exciting! The kids were already thrilled from the first set of fireworks. Lily was clapping and grinning ear to ear! Then...it happened again! 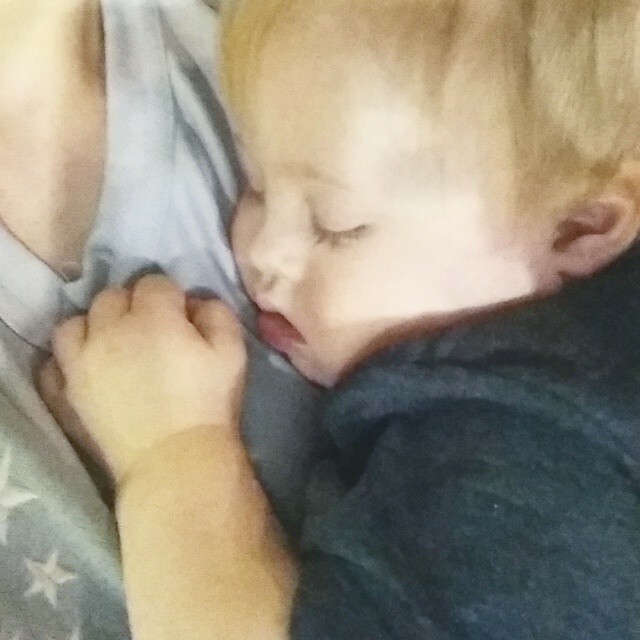 After the excitement, Liam started to get sleepy. He was an absolute angel for the entire game, and I was so impressed he lasted so long! 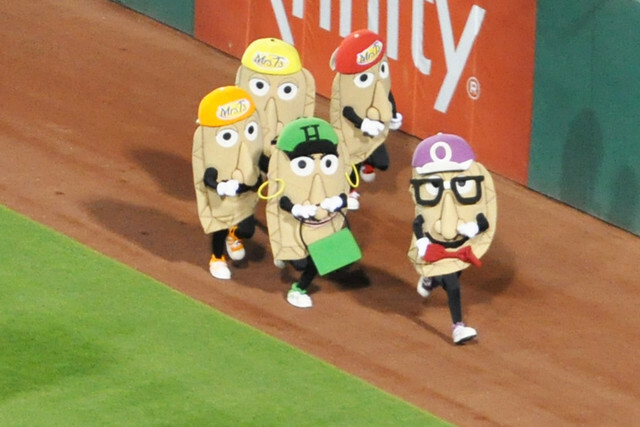 Finally, it was time for the Pierogie Race! Oh yeah, it's a thing. 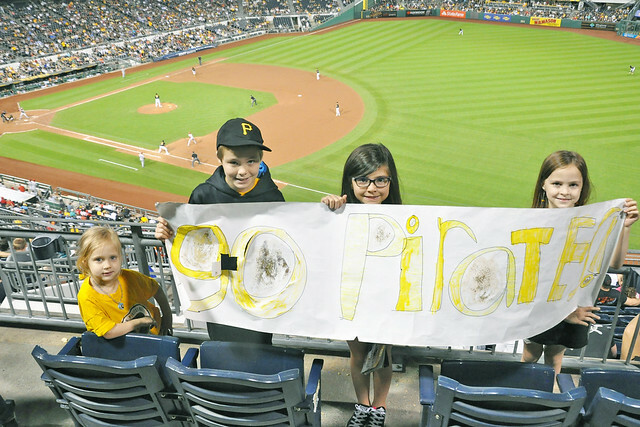 The kids look forward to it every time we go to a game! Darkness settled over the city, and Liam fell asleep amidst all the noise. By that time, it was getting really late, so we decided to leave just before the game ended. The kids were reluctant to leave, but everyone was getting sleepy! As we left, Grant snapped a quick picture to prove I was there! We only had one brave person ask if all the kids were ours. There may have been a few strange looks, too, but I'll call that a win! We very successfully survived the game with 5 kids, and we ALL had fun! 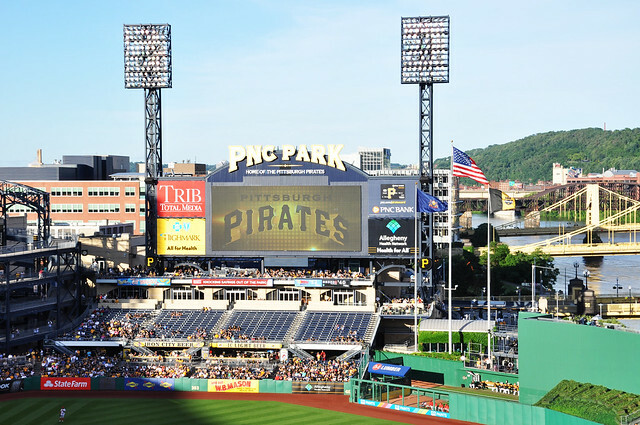 Even though we left a bit early, the Pirates pulled off a win. 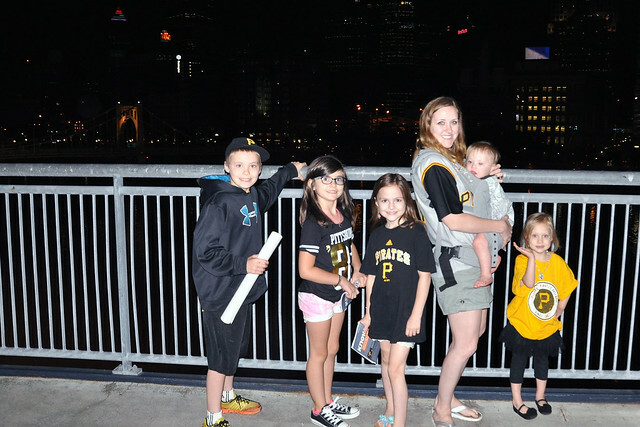 It was a great night for baseball in Pittsburgh and such a memorable night for my family! Go, Pirates!!! We had a great time and the view is always so beautiful! Thank you! We had a great night! What a fun family night! I love summer evenings at a baseball game. I mostly go for the hot dogs though. I know nothing about baseball. Haha! Haha! I didn't really pay close attention! That is so awesome! What an amazing prize to win I bet the kids were so thrilled just having that experience. They had a great time! 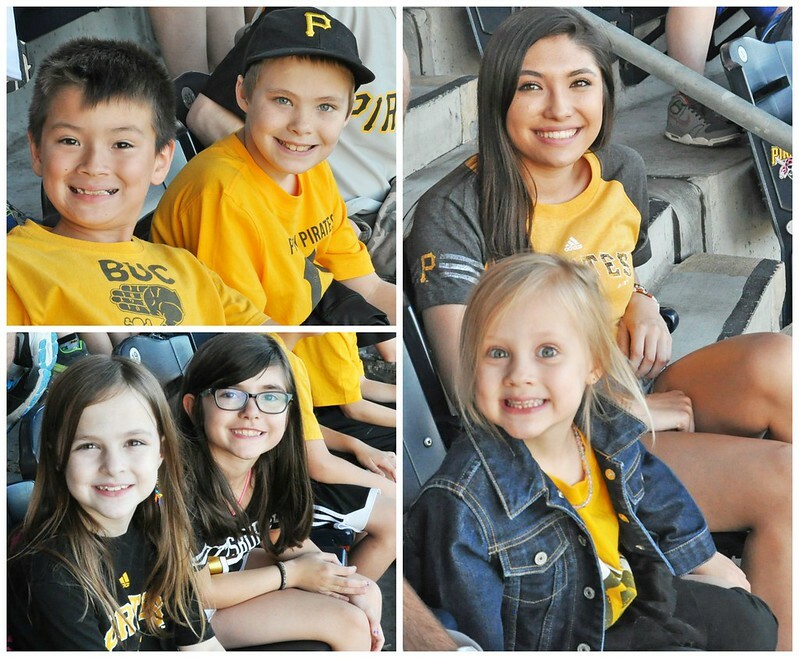 We go to games once or twice a year, and they always look forward to it! Beautiful views! It looks like you had a great time. 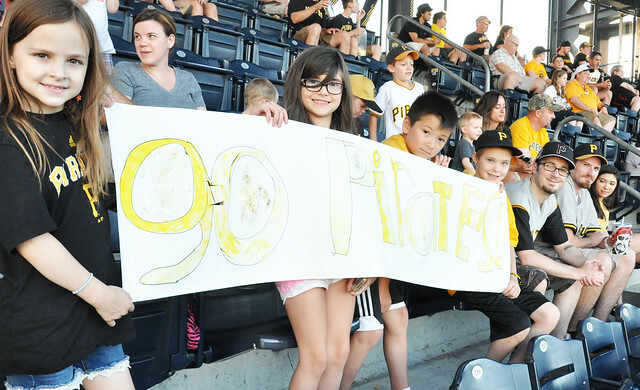 We love baseball games in the summer! The views from the park are gorgeous! We all had fun! Baseball games are always fun! 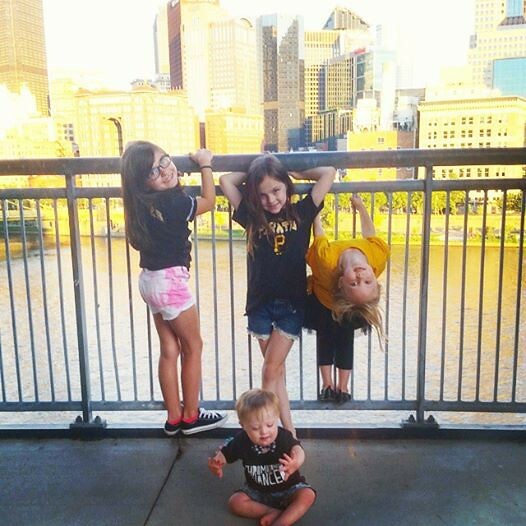 We love going to reds games but havent been able to go this year yet! My kids look forward to going every year! What a fun night! We have a minor league team that plays close to us. I always thing about taking the kiddos, but then we forget. This post makes me want to plan a game night.